Norma Kamali standing in her Manhatten showroom with part of her spring 1997 line, featuring silkscreens of Mahatma Ghandi. 1981; produced sportswear for Jones Apparel Group, 1981; child-ren's sportswear for Empire Shield Group, 1982; sportswear for Renown Corporation, Japan, 1983; costume designer for the Emerald City in The Wiz, 1983; designed and opened Norma Kamali Building, New York, 1983; bags and footwear for Vittorio Ricci, 1983-84, headwear for Stetson, 1983, and belts for Raymon Ridless, 1985; signature fragrance collection introduced, 1985; OMO home collection introduced, 1988; (800) 8-KAMALI line of casual wear introduced, 1993; cosmetics line introduced, 1994; produced and directed Fall Fantasy video; costume designer for three Twyla Tharp dance performances (The Upper Room, Sweet Fields, Route 66), 1995-96; commencement speaker for Fiftieth Anniversary of the Fashion Institute of Technology, 1995; Kamali website created, 1996; broadcasted Fall 1996 collection as virtual reality experience over the Internet, 1996; Internet shopping service "Shop Like a Celebrity" introduced, 1998; created New York Public Schools website ( www.nycpublicschoolart4U2c.com ) to exhibit student artwork, fashion, and poetry, 1998; Living Rubber collection introduced, 1999; website evolved into a directory of seven linked sites, 2000; business opportunity for local representatives of NK Jersey line introduced, 2000. Exhibitions: Parachute designs displayed at Metropolitan Museum of Art, New York, 1977. Awards: Coty American Fashion Critics award, 1981, 1982, 1983; Council of Fashion Designers of America award, 1982, 1985; Fashion Institute of Design and Merchandising award, Los Angeles, 1984; Fashion Group award, 1986; Distinguished Architecture award from New York Chapter of American Institute of Architects; Outstanding Graduate award from the Public Education Association of New York; award of merit, Video Culture International Competition; American Success award from the Fashion Institute of Technology in New York, 1989; Washington Irving High School's Hall of Fame for distinguished alumni, 1997; Youth Friends award, 1997; Pencil award, 1999; Willow award from Lower East Side Girls' Club, 1999; Fashion Outreach Style award, 1999. Address: Norma Kamali Building, 11 West 56th Street, New York, New York 10019, USA. Website: www.OMO-norma-kamali.com . "Fashion," in the New York Times, 1 January 1989. 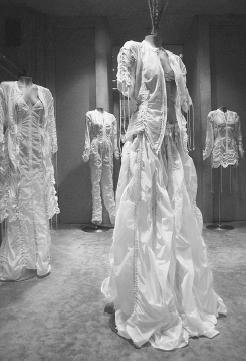 Norma Kamali, spring 1998 collection: wedding gown made of parachute nylon. "Norma Kamali Talks to Sarah Montague," in Ritz (London), No. 25,1978. "The Kamali Effect," in Vogue, June 1982. Krupp, C. "Reluctant Fashion Guru," in Glamour, September 1982. "Working Seventh Avenue Has Been No Sweat for Fashion's Greta Garbo," in People, 27 December 1982. Radakovich, Anka, "Hot Kamali's 'Kicky' Clothes," in Apparel News (New York), April 1984. Talley, André Leon, "True Wit: The Zany World of Norma Kamali," in Vogue, November 1984. "Norma Kamali: An Interview with the Fashion Video Pioneer," in Back Stage, 14 November 1986. "Shirting the Issue: Norma Kamali," in Self (New York), November 1988. Hamilton, William L., "The State of the Shape: Va-va-voom," in Metropolitan Home (New York), April 1989. Schiro, Anne-Marie, "Pastels at the Plaza, Cowgirls in the Park," in the New York Times, 31 October 1989. "The Designers Talk Passion, Whimsy, and Picassos," in ARTnews (New York), September 1990. Schiro, Anne-Marie, "A Spectrum for Spring, Hot to Cool," in the New York Times, 31 October 1990. Brubach, Holly, "In Fashion: On the Beach," in the New Yorker, 2September 1991. Schiro, Anne-Marie, "Patterns," in the New York Times, 4 August 1992. ——, "For Evening Wear, Various Degrees of Retro," in the New York Times, 31 March 1993. "That Vargas Vamp," in American Photo (New York), March/April 1993. Gandee, Charles, "Hot Kamali," in Vogue, April 1993. La Ferla, Ruth, "Mode: Norma Kamali," in Elle (Paris), July 1993. White, Constance, "Some Age Gracefully," in the New York Times, 31 October 1995. Colman, David, "Norma Kamali Cleans House," in the New York Times, 22 February 1996. Schiro, Anne-Marie, "Three Clear Signatures," in the New York Times, 28 March 1996. White, Constance, "Norma Kamali Aids Students," in the New York Times, 11 February 1997. ——, "Eccentricity is the Key to Invention," in the New York Times, 9 April 1997. ——, "Definitive Lauren, Ingenious Kamali," in the New York Times, 2 April 1998. "Norma Kamali," in Current Biography Yearbook, November 1998. Luther, Marylou, "Kamali Meets Fans on Line," in the New York Times, 5 January 1999. Crow, Kelly, "Mere Bits of Skimpy Plastic are Hits at Sample Sale Day," in the New York Times, 2 July 2000. Bellafante, Ginia, "Kamali, Inspired by Kamali," in the New York Times, 14 November 2000. In a highly original way, Norma Kamali has been designing with uncanny foresight for the modern woman's multifaceted lifestyle. The sensational success of her sweatshirt-fleece fabric line in 1981 brought Kamali clothes into the mainstream, while she continued to design experimental, one-of-a-kind fashions for wealthier clients. The mass produced sweats offered good design in comfortable clothes, with a touch of the eye-catching elements that have distinguished Kamali. Inspired by the late 1960s British clothes she brought back from England to sell in the New York Norma Kamali boutique— the retro Biba clothing of Barbara Hulanicki in particular—Kamali began offering her own designs to keep up with the demand. When she opened her New York OMO (On My Own) boutique in 1978 after her divorce, Kamali symbolized all newly independent women. As early as 1972 Kamali designed bathing suits according to her own vision: gold lamé maillots, structured or spare bikinis, decorated or plain, introducing the then-startling high-thigh styles with cutouts to show off a well-toned body-beach fashions that became mainstream as the 1980s progressed. In the late 1960s Kamali was credited with the hot pants craze. A sense of playfulness combined rhinestones with stretch leotard material, pleasing the celebrities who patronized the Madison Avenue store. In 1974 Kamali changed to a more refined look, lacy and delicate, specializing in well-made suits and dresses. It was in the West Side OMO store that Kamali came into her own. Cozy down-filled coats became popular after she introduced them, spurred by the necessity of sleeping in a sleeping bag after her divorce. Drawstringed jumpsuits made of colorful parachute material resulted in her inclusion in the Vanity Fair Exhibition at the Costume Institute of the Metropolitan Museum of Art. She showed draped 1930s-styled jerseys, and exaggerated broad shoulders on garments from coats to sweatshirt dresses to evening gowns, always a little before her time. She also utilized suede in bright colors before it became trendy. Kamali 1950s-style "Ethel Mertz" dresses were fabricated in plaid flannel, certainly different than anything else on the streets in the early 1980s. Her short cheerleader skirts were the first popular miniskirts in a decade. Dramatic lamé accents appeared on special occasion sweats and she designed sweatshirting for children. Kamali epitomized the shy person who allowed her clothes to speak for her, yet there has always been an inner strength leading to her successful business enterprises and the willingness to take risks. Using her boutique as an atelier, Kamali has been producing one-of-a-kind garments from unusual fabrics in versatile shapes to be worn in a number of ways. She was one of the first to present unitards or bodysuits as serious fashion staples. As in French couture, Kamali listens to her customers, on whom she has waited in person in her boutique, to get their honest opinions. She has described herself as relying upon intuition, taking inspiration from the street, but making it her own as if in a creative trance. Her credo has been to make the functional aspects of clothing attractive, taking inspiration from the unique qualities of each fabric, always designing for the woman who will wear the clothes. Kamali launched a modern collection of interchangeable pieces that blended as quickly as the modern woman's lifestyle in 1995. The collection featured a wardrobe made from a revolutionary polyester jersey fabric Kamali described as "soft as silk but strong as steel jersey." Highly suitable for travel, the collection, the NK Jersey Line, emphasized wrinkle-free and machine-washable comfort in black, red, or white. This line kicked off a wave of practicality and a less-is-more attitude. In 1996 Kamali purged many of her personal belongings and furniture in an auction, banned black from her new collection and wardrobe, and looked forward to the new millennium. The star ensemble of the fall collection featured a dark-brown velvet jacket over a yellow chiffon shirt and gunmetal leather pants. Improvements and ingenuity defined her designs for the remainder of the 21st century. Her ever-faithful 1970s silk parachute coat was modernized in a more practical nylon in colors reminiscent of military gear, and she maintained a standard of ensuring even her most luxurious European-styled designs remained wearable and unique. Throughout her career Kamali has inspired other designers, and has been considered one of the most original designers in New York. She has brought the inventiveness that used to be allowed only in couture salons to versions affordable to working women, although many of her more exclusive designs remain high-priced. Kamali has also introduced revolutionary marketing techniques to fashion merchandising. Twenty-four hours a day, fashion videos play in the windows of OMO. Unlike ordinary catwalk videotapes, Kamali videos are actually minimovies, often as long as 30 minutes, with storylines and character development, showing various situations in which Kamali fashions might be worn. Kamali also advertised through the use of billboards and by staging fashion shows in New York's Central Park. By 1993 she was offering a toll-free number for ordering her new lower-priced label, while retaining the OMO Norma Kamali label for her expensive line. But it was in 1996 marketing embarked on a high-tech journey to move OMO into the new millennium. The Internet became the runway for a virtual-reality simultaneous-broadcast of Kamali's fall 1996 collection. Later in the year the company website ( www.omo-norma-kamali.com ) was created, featuring Kamali's (800) 8-KAMALI collection, a direct marketing service called "Shop Like a Celebrity" which provides clients with a personal shopper and purchasing ease, and a business opportunity for individuals interested in becoming a local representative of the NK Jersey Line. As OMO evolved into a 21st century marketplace, Norma Kamali continues to inspire. She has adopted the role of mentor and educator. Since 1997 Kamali has organized art students from her alma mater, Washington Irving High School, to develop a business for teaching art and commerce. She also set up an avenue for New York Public School students to exhibit their artwork, fashion, and poetry on a website ( www.nycpublicschoolart4u2c.com ). Kamali clothes remain timeless in evoking past fashion eras while representing a modern outlook in interpretation, use of new materials, and technology. Back in 1991 Kamali presented bell-bottomed trousers, then scoffed at by the fashion press, which became standard in the revival of the 1970s. She herself revived her own fake leopard print coats to combine in the eclectic individualistic mood of the late 1990s with other garments having vintage and ethnic overtones. Soft flowing floral tunics, Edwardian and 1930s detailing, hip-huggers, lace dresses all in spirit with the times denote the experimentation that has always been the hallmark of Kamali's style and has at last caught up with her fashion forward attitude. Shiny Lurex bathing suits feature underwire cups and a direction toward a more covered-up look in response to the new consciousness about the dangers of sunlight. Her own best model, Kamali epitomizes the 1940s vamp, a characteristically classic expression of her aesthetic: she has made self-expression seductive.